The Army Ant is in the domain of Eukarya because of its true cellular orientation. The Pearl Oyster Mushroom is another organism in the domain Eukarya. It is further divided into the Animalia Kingdom for its characteristic of feeding off of other organisms. They are specifically detritivores because they feed off of partially decomposed dead material in a technical sense (Encyclopedia of life 2013). Another example of a Kingdom Animalia species is the Domestic Chicken. 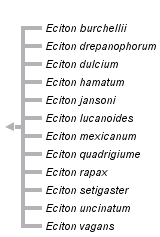 Eciton burchellii is in the Phylum Arthropoda because they are bilaterally symmetrical protostomes (symmetrical between one longitudinal plane of symmetry with the mouth forming first in growth) and strong, segmented bodies. They also have a chitinous exoskeleton and a mostly open hemocoel circulatory system (Animal diversity 2012). Another organism in the Arthropoda phylum is Lucilia sericata (Common Green Bottle Fly). Eciton burchelii have a head, thorax, and abdomen, one of the main characteristics of the Insecta Class. Another organism in the Insecta Class is the Pennsylvania Firefly. Hymenoptera is Greek for “membrane” and “winged”; Army Ants have membranes and a portion of Army Ants are, in fact, winged (although the queen is not). 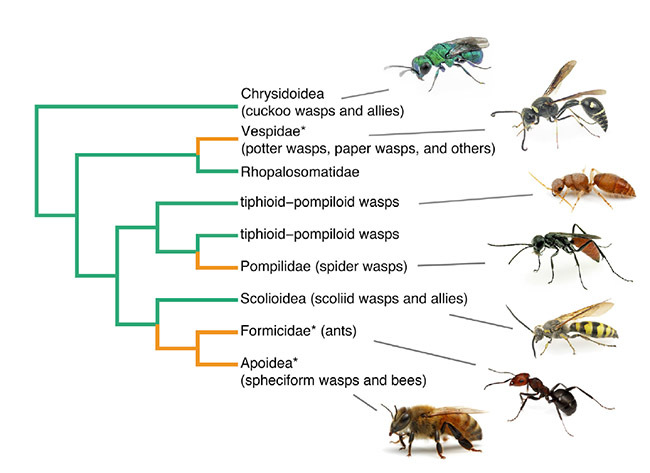 Another characteristic that puts them in the Hymenoptera Order is their social behaviors and queen-worker social stratification system (Hymenoptera 1994). Another organism in the Hymenoptera Order is the Black Ant. Ants are placed in their own Family: Formicidae; an Army Ant is definitely an ant. Another example of an ant in the Formicidae Family is Cataglyphis bombycina. A unique characteristic that keeps Genus Eciton separate from the rest of the Formicidae family is that the queen does not have wings. The two most studied species in the Eciton genus are burchellii and hamatum. Species hamatum are column raiders (they branch out evenly over a distance, like a tree), whereas burchellii are swarm raiders (they form a fan-shaped swarm front from a smaller column front linking back to the bivouac).